It is with the saddest regret that we announce the death of our relatives. We know that the journey is the last and the pain is unbearable. It triggers a flood of emotions. 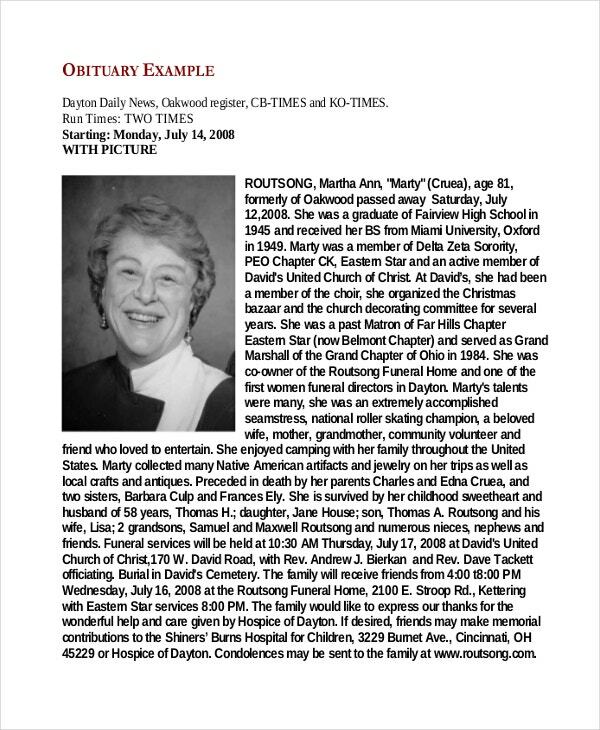 In this regard, a sample obituary example helps you rejoice their memories. Pay homage to those who fought for most of their life with the odds and uncertainties and stood as a source of inspiration with their achievements. If you think that the upcoming days will be clouded with dark memories of past, just hold away that feeling with our Obituary examples. 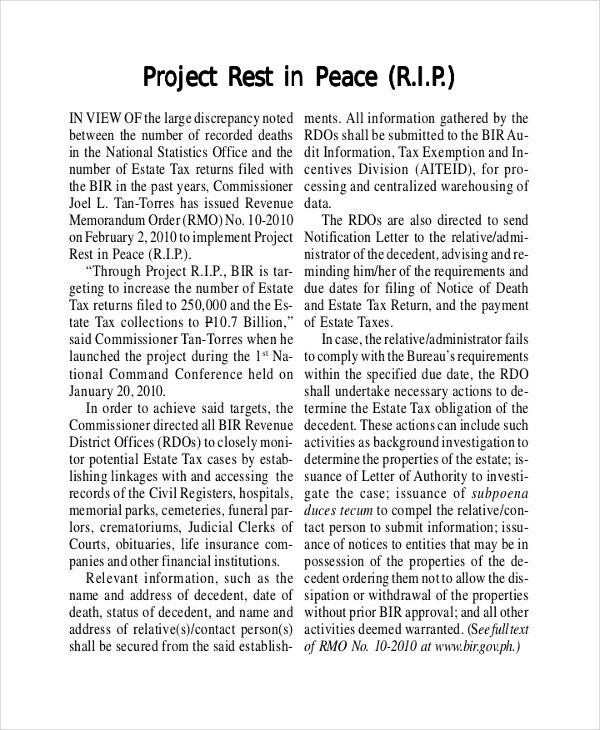 Rest in Peace Obituary Program examples bid a happy adieu to the deceased. They come with a bold look and embosses the logo of the makers. The template assures that the deceased is among us, even if not physically. The cherishing smile keeps you with your loved ones, always. An Obit in a selfie age takes a whole new turn with many scripts readily available online. Have you ever thought of writing your own obituary? It probably would be the most important story in anyone’s life. But leaving the chance of writing your obituary to somebody else may make a debacle of it. These Selfie Obit Program examples help you tell your own story by mentioning your highlights and other parts of your life one by one with self-describing terms. You can get away with a lot of things in our examples. 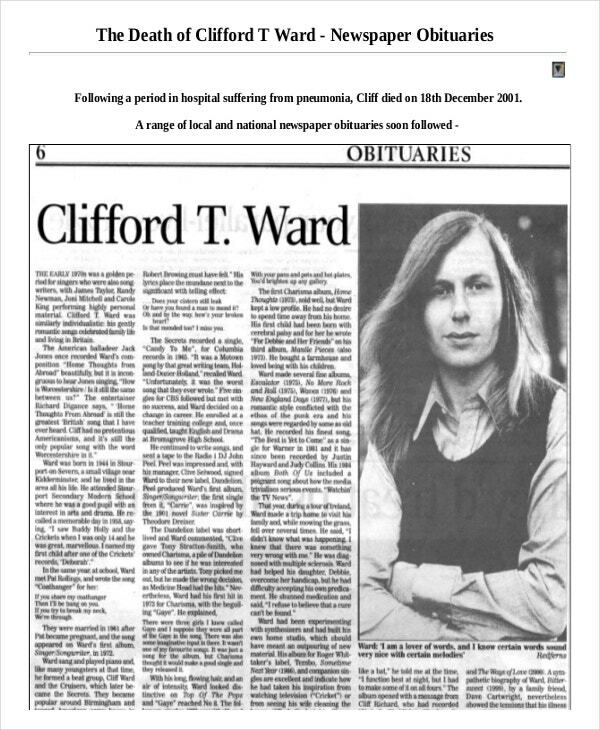 Chronicle Obituary Program Examples are useful for chronicle Obituary programs. That means you can rehash the examples as many times as you need. You can add as many pages as you want to the example. After all, this is the last rite you perform for your loved ones. The newspaper is the most read platform for death notices. 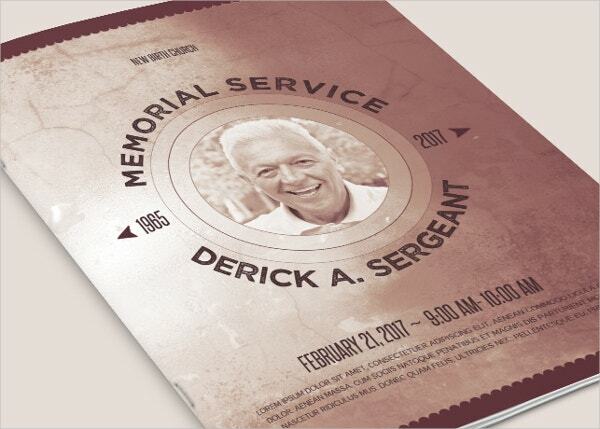 Our Newspaper obituary templates are available in small, medium, and large sizes. Notify the homage for your elderly and youngerly. The language used in the templates is polished and furnished. 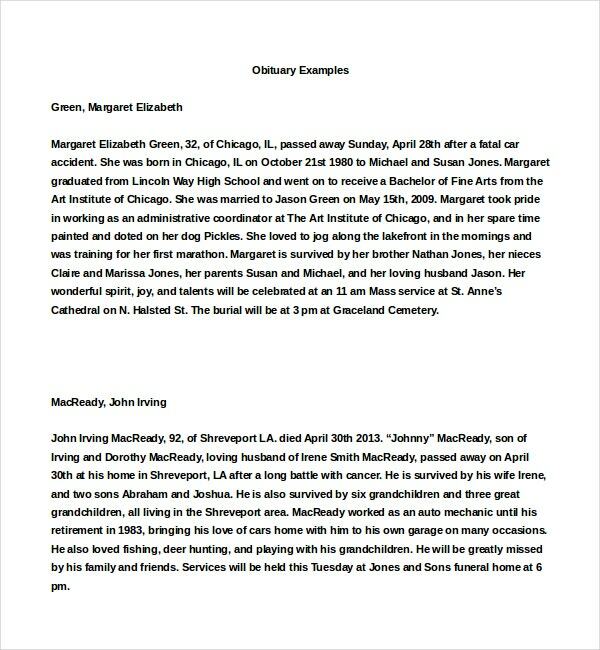 Download the motherlode of all obituary templates now and let the life story live in there forever. Obituary Writing Examples will be by your side in your most tragic losses. 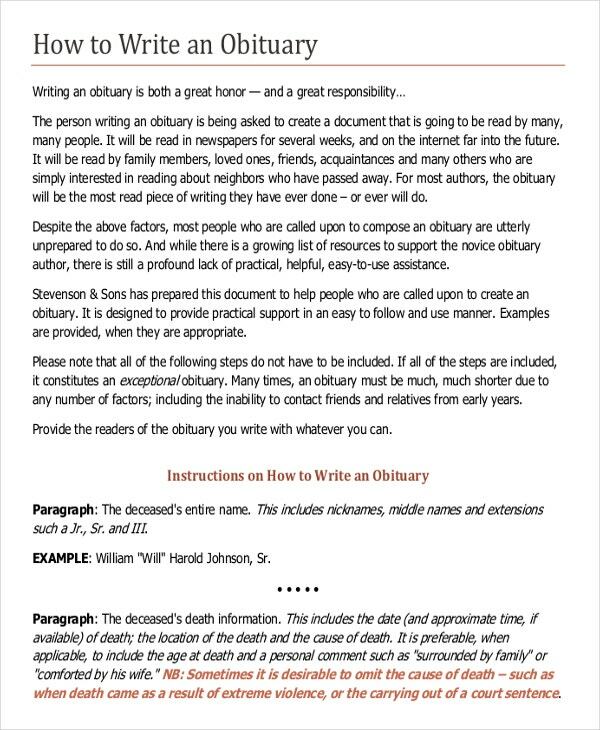 Our Obituary Writing Examples can be used for funeral ceremonies and as ads in newspapers as well. Convey your heartfelt grief and sorrow for the sad and sudden demise of your kith and/or kin, who always stood as a chest of knowledge and remained stoical all their lives. Mother is the first teacher for anyone. We are all blessed to learn many valuable lessons from her throughout our lives. 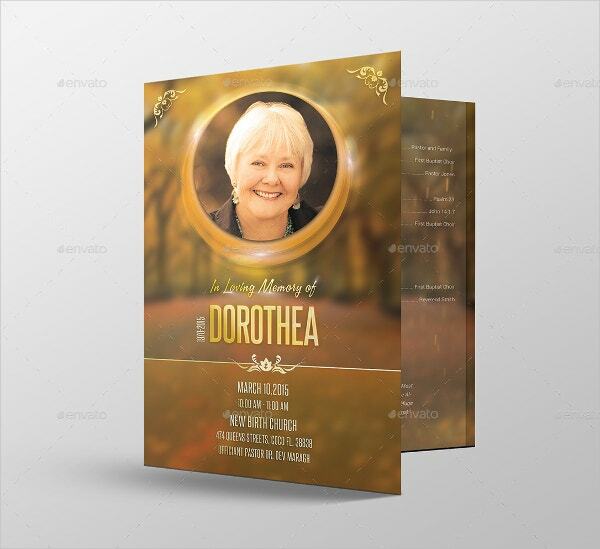 Now in her remembrance, respectfully invite all your relatives, friends, and other well-wishers to her funeral ceremony. Take the help of our obituary examples for the mother. May her soul rest in peace. We know that a thousand words can’t bring your loved ones back. We even know that a million tears also can’t get them back. But a befitting obituary will provide an opportunity to recall the fond memories and convey the deep regards to those whom you treasure for their values and principles. 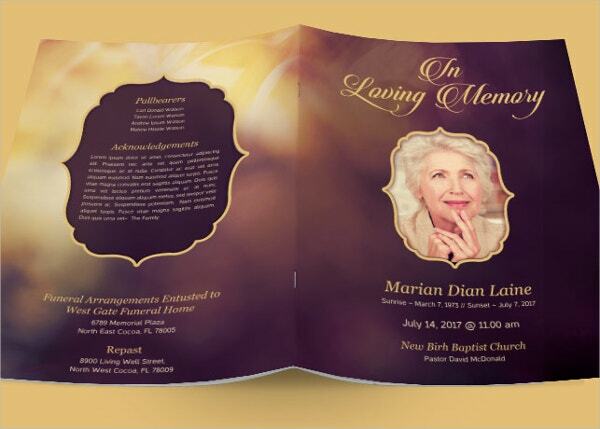 These Funeral Obituary Examples help you pay Philomena obituary to the sad demise of your dearest ones. If tears could build a stairway and memories a lane, people would walk right up to heaven and bring their loved ones home again. But that is not possible. Hence, it is better to realize that those who are done with the job here will receive a call, a kind of offer, which they cannot refuse. However, the death can take away the people physically but the memories, moralities, and more than anything else, the richness of their smile prevail. Our Free Obituary Examples help to intimate the news about the death and other rituals one-to-one. Love is eternal. Love is everything. 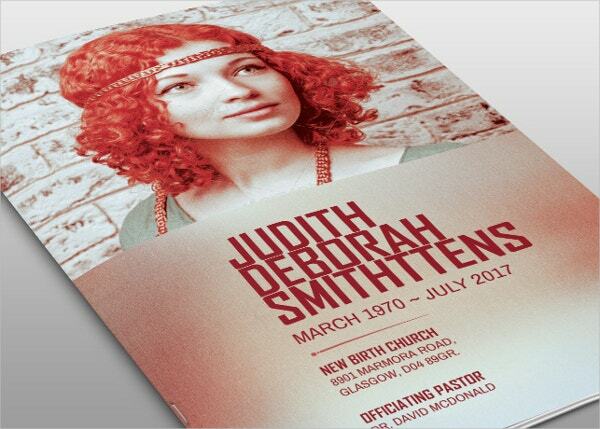 Our Love Obituary Program Templates reinforce the same. It is the best way to shower your love towards your loved ones who are no more. You can also see Death Obituary Template.